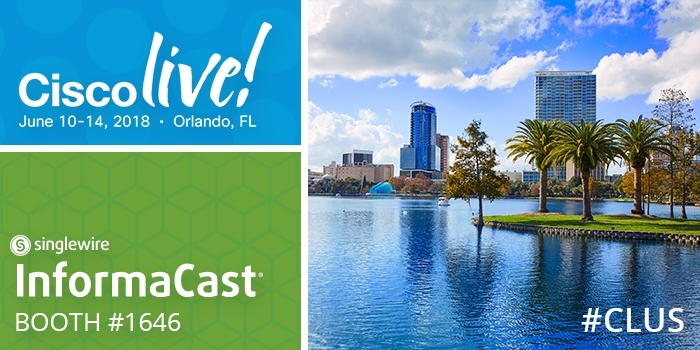 Singlewire Software will be at Cisco Live!, June 10-14, 2018 in Orlando, Florida. This event delivers education, connection, and inspiration to technology enthusiasts. Cisco Live! is Cisco’s annual user conference where partners and customers learn about new technologies, discuss business trends, share ideas, and network. Over 25,000 attendees and 200 exhibitors are expected to attend this year’s event. See everything the conference has in store by looking at the full schedule of sessions, workshops, and events. Singlewire will be located at booth 1646. Find us and see what other companies will be there by reviewing the full exhibitor list. You can also stay engaged with the event by following Cisco Live! on Twitter, LinkedIn, and Facebook, and look for updates on channels from Singlewire. Inbound Triggers for InformaCast Fusion – The latest update for InformaCast Fusion offers new options to trigger broadcasts with inbound RSS, Common Alerting Protocol (CAP) and email. Measuring ROI on an Emergency Notification System – An emergency notification system is a big investment. Chat with our experts during the show to learn how to measure return on investment. Desktop Notifications – Outside of a Cisco IP phones, the device most people will have at their desk is a computer. See how InformaCast Desktop Notifier offers flexible alerting options to ensure people see critical messages. Best Practices for Avoiding Alert Fatigue – Alert fatigue can have a negative impact on an organization’s duty of care. Talk with us about utilizing best practices when deploying emergency notifications. Before the show, you can also download our emergency notification system buyer’s guide to learn what your organization needs to implement this safety solution. In our guide, you will find frequently asked questions and insights to help determine the best solution for your needs. As part of our embrace of the spirit of imagination, we’re inviting Cisco Live! attendees to stop by our booth and take a picture with our Willy Wonka cutout. Attendees who tag Singlewire on Twitter, Facebook or LinkedIn, and use #CLUS in their post, will be entered into a daily drawing for an Oculus Rift + Touch. Visit us at booth 1646 for your chance to win!